It's a safe bet that several of the companies above will go bankrupt or be taken into receivership. The amount of capital destroyed already has been immense. Many of those charts sport prices all the way back to 1998 or even before. That is some unwind. With imploding residential real estate, imploding commercial real estates and with Unemployment Soaring While Private Sector Jobs Contract we can expect dramatically rising credit card defaults as well as millions more repossessed homes. There is nothing remotely inflationary about any of that. The message behind gold is simple: Gold is acting like money because gold is money. In deflation, the value of money rises. Money is hoarded. Furthermore, in economic turmoil in general, gold is sought as a safe haven. Gold has both of those things going for it. With leverage everywhere under attack however, there is a possibility of a sharp pullback. From what level such a pullback might occur is anyone's guess. There is a shortage of cheap oil. There is also a geopolitical payback for this administration's misguided policies in the Mideast. Unfortunately, people confuse a shortage of oil and misguided government policies with inflation. Those who think inflation is about prices need to read Inflation: What the heck is it? Oil is a wild card. If Bush attacks Iran oil can easily spike to $200. There would not be anything inflationary about that either. An oil spike to $200 could even trigger a depression. On the other hand, as the global recession picks up steam and leverage is forced out of 10,000 hedge funds all betting the same way on commodities, oil could easily fall all the way back to $50. Copper was on a tear with housing. 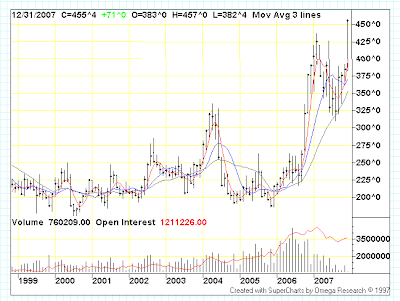 It is still lofty but that chart looks like a massive double top from a technical viewpoint. As the recession picks up steam I would expect sharp pullbacks in copper and base metals. If leverage is forced out of 10,000 hedge funds as I suspect it will, the drop in some commodities might be spectacular. Corn's message is about an artificial shortage caused by misguided ethanol policies from this administration. In addition, a rising standard of living in China is increasing the demand for corn. Finally there is the effect of commodity speculation by countless numbers of hedge funds all willing to bet the farm on rising commodity prices. Tech's message is the anti-3-letter-acronym-play. Tech has nothing to do with housing, CDOs, SIVs, CMOs, and other three letter acronyms that are affecting much of everything else. So investors and hedge funds have once again pushed up technology stocks and the QQQQ to insane multiples. The rise in QQQQ was an asymmetrical rise with chip stocks (SMH & $SOX) in the gutter and a mere handful of stocks such as Apple (AAPL), Research in Motion (RIMM), Google (GOOG), and Amazon (AMZN) accounting for most of the gains. This same lack of breadth in conjunction with "no price is too high" mentality was present at the 2000 peak. Headed into 2008 the question is: Will a rally in financials lead the market higher or will tech stocks and other "safe havens" start to catch up on the downside? With a recession on the way and the housing bottom as far off as 2012 (see When Will Housing Bottom? ), technology high flyers and various commodities have a lot of catching up to do on the downside as the asymmetrical unwind of the credit bubble continues.